Rob is an urban and social geographer with an interest in all things night. He has been working at Newcastle since September 2015, having previously worked as a Teaching Fellow at Durham University where he obtained his PhD in 2012. 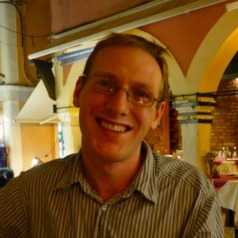 His PhD research exploring the urban night was funded by the ESRC, with outputs published in several journals including Environment and Planning A, Geoforum and Theory, Culture and Society. His more recent research has been funded by the Durham Energy Institute and explored street lighting in England and Wales: key findings were presented to the Institute of Lighting Professionals in 2014. He has shared his expertise with media such as the North-West Evening Mail, and even in stand-up comedy form at the Newcastle Bright Club. His research has looked at how night-lives are produced not only in the bars, clubs and restaurants that we mainly associate with night, but also in the spaces and activities that manage and produce our cities. His work focuses on how street-cleaners, taxi drivers, street-lighting engineers and others keep the city centre usable at night. As well as city centres, Rob has developed an interest in how home is produced at night, how nights differ globally, and how these are being transformed as culture 'intensifies', requiring evermore activity around the clock. He has also touched on other research areas including leisure and regeneration, infrastructure, and human-environment relationships.